The main difference between B cells and plasma cells is that the B cells are a type of white blood cells involved in adaptive immunity whereas the plasma cells are activated B cells. B cells and plasma cells are two types of white blood cells in adaptive immunity. Here, the B cells are responsible for the production of antibodies, serve as antigen-presenting cells, and secrete antibodies while the main function of plasma cells is to produce a large number of antibodies. Naïve B cells – B cells that are not exposed to an antigen. Once exposed, naïve B cells can differentiate into other types of B cells. 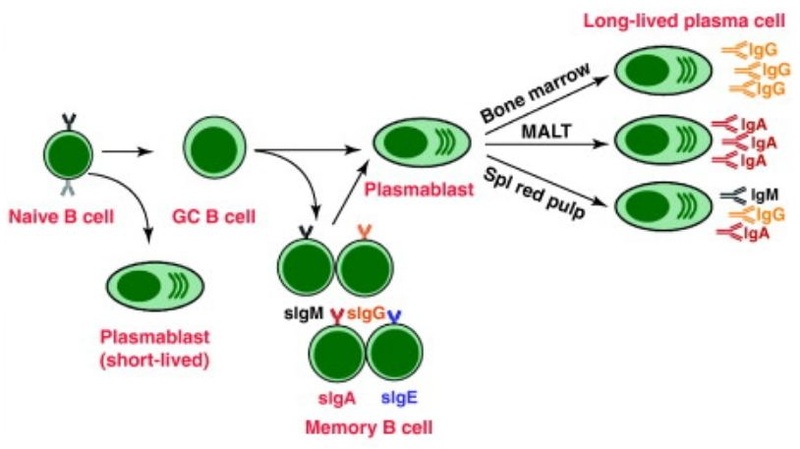 Plasmablast – Early stage of B cell differentiation in response to exposure to an antigen. It is a short-lived cell, which can proliferate. It produces a small number of antibodies when compared to plasma cells. Plasma cell – Final stage of B cell proliferation. It is a long-lived B cell that is unable to proliferate. It secretes the highest amount of antibodies. Memory B cell – Dormant stage of B cell differentiation. It has the longest lifespan among the B cell types. It circulates throughout the body in order to generate a stronger immune response known as the secondary antibody response. B-2 cell (FO B cells and MZ B cells) – FO B cells are the most common type of B cells responsible for the production of high-affinity antibodies. They occur in the secondary lymphoid organs or lymphoid follicles when not circulating. On the other hand, the MZ B cells are responsible for the first line defence against blood-borne pathogens. They occur in the marginal zone of the spleen. B-1 cells – Produce natural antibodies against the mucosal pathogens. They occur in the peritoneal and the pleural cavity. Plasma cells are a type of B cells responsible for the production of antibodies against a specific pathogen. They are a type of differentiated B cells upon the exposure to a particular antigen in a process called B cell activation. Looking at its production; the production of B cells occurs in the bone marrow. First, B cells leave the bone marrow to serve as the antigen presenting cells (APCs). Then they internalize antigens via receptor-mediated endocytosis. Next, they present the processed antigens along with the MHC class II molecules to the T helper cells. The binding of the T helper cells to MHC class II molecules causes the activation of the B cell. Upon activation, the germinal centre of the B cell can either differentiate into a plasma B cell or a memory B cell. Moreover, the activated B cells first differentiate into plasmablasts and then, they become plasma cells. Here, the plasmablasts produce a small number of antibodies but, the plasma cells are responsible for the production of a large number of specific antibodies. B cells and plasma cells are two types of white blood cells in the circulation. Both are lymphocytes; hence, they do not contain granules in the cytoplasm. Also, both of their nucleus is large and round in shape. Besides, both have an important role in adaptive immunity by producing antibodies. B cells refer to the lymphocytes that are not processed by the thymus gland, and responsible for producing antibodies while plasma cells refer a fully differentiated B-lymphocyte, which produces a single type of antibody. 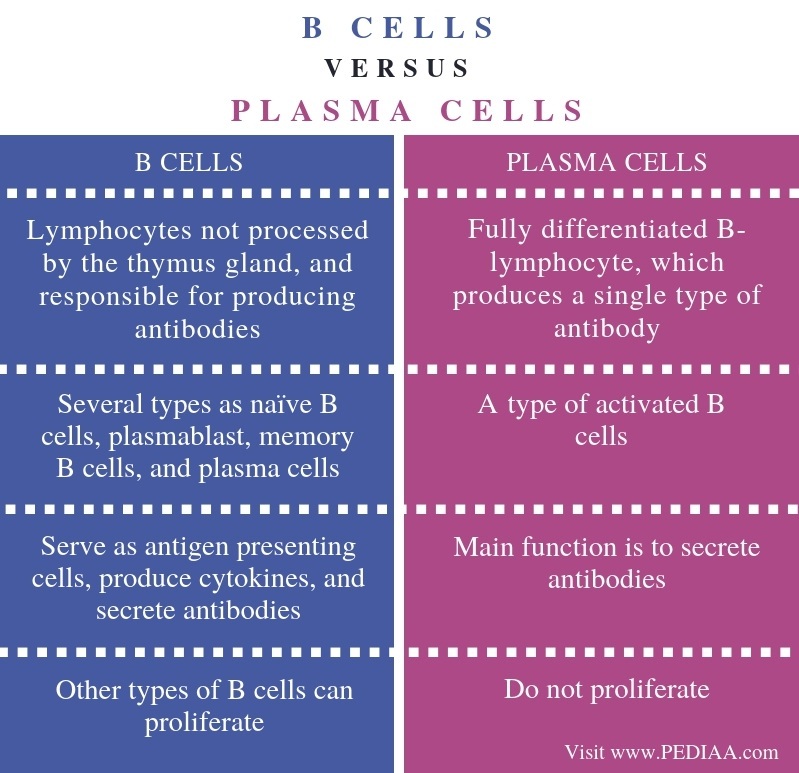 Thus, this is the main difference between B cells and plasma cells. Moreover, there are several types of B cells as naïve B cells, plasmablast, memory B cells, and plasma cells while plasma cells is a type of activated B cells. A major difference between B cells and plasma cells is their function. B cells serve as antigen presenting cells, produce cytokines, and secrete antibodies while the main function of plasma cells is to secrete antibodies. Other types of B cells can proliferate while plasma cells do not proliferate. Hence, this is another difference between B cells and Plasma cells. B cells are a type of lymphocytes responsible for the production of antibodies in adaptive immunity. Here, the B cells that are not exposed to an antigen are called naïve B cells. Upon exposure, it differentiates either into a plasma cell or memory cell. Plasma cells are the main type of B cells, which produce a large number of specific antibodies. Therefore, in conclusion, the main difference between B cells and plasma cells is the degree of differentiation and the production of antibodies.